Furthermore, Governor Wike has responded while Speaking at the PDP Rivers West Senatorial District Campaign rally at Ahoada on Saturday,saying that only a man with psychiatric disorder will compare his failed eight years in office to just eight months of the new administration. He said the former governor failed in his eight as the state chief executive. According to him, Amaechi lacks proper parental upbringing hence his desperation in the political arena. Governor Wike said that the APC has refused to campaign for the rerun elections because they are relying on the military and security forces to rig. "He is a psychiatric patient who was at the radio station abusing people who are old enough to be his fathers/mothers simply because his party lost at the Supreme Court. "We will defeat Amaechi again and again. No matter the deployed to Rivers State, the PDP we will all the seats ". The governor said that Amaechi during his radio tour confessed that the military has been handed over to him to rig elections in the state. He added that the plot would fail woefully as the Rivers people will defend their mandate. He pointed out that Amaechi's personal friend Mr Tosin Ajayi was posted to Rivers State as DSS director with the evil objective of creating the environment of rigging. He said : "Only yesterday, I intercepted the communication of the DSS director and the Brigade commander where they were planning on the ways of rigging the election alongside Amaechi. That plot has failed. "Amaechi lacks sound parental upbringing. He has vindicated us when he said that he has been given the army to rig the rerun elections. I know the Chief of Army staff very well. He should not allow a psychiatric patient to use the Army to rig. "Is Amaechi now the Commander in Chief of the Armed Forces that he talks about deploying soldiers? Our people will rise up to defend their votes. They will make the needed sacrifices their votes", Governor Wike said. He reminded the people that on May 27, 2015, Amaechi made a statement that his (Wike ) administration will be unable to pay salaries and execute projects. He said he has confounded through the execution of pro-people projects across the state, payment of salaries and pensions. He called on the people of Rivers West Senatorial District to vote overwhelmingly for the PDP for uniformed development to be entrenched in the state. The Governor said that development of the communities rests with his administration, pointing out that he has discharged his responsibility faithfully. 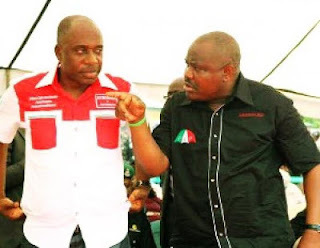 Governor Wike said no matter the time it takes Amaechi will face trial for stealing Rivers resources . "If President Muhammadu Buhari visits Amaechi's house in Asokoro, he will never allow him to come into Presidential Villa. After the case initiated by Amaechi over his indictment, he will face justice for embezzling state funds"
Also speaking , PDP Deputy National Chairman described the former governor as a pathetic liar who mismanaged resources of the state. He said : "Amaechi needs urgent proper psychiatric evaluation and treatment. We call on Dr Parker to treat the former governor ". He said Amaechi's appearance on different radio stations is merely an avenue to create crisis in the state. He said: "No amount of blackmail will pull down the administration of Governor Wike. Amaechi was a failed governor ". The Rivers North West Senatorial District Campaign rally attracted PDP faithful from the eight local government areas of the district.